Imagine this! Your friends are partying at your pad. You look gorgeous in your designer casuals flaunted with this beautiful scarf, perfect for this occasion. Top it off with this gorgeous home decor. Your friends are awestruck & totally jealous of your beautiful ensemble and accessories. But you sure are proud of sweet possessions from Sweet Us your scarf and tablecloth. Yes! Yes, that's exactly how Sweet Us was born. It literally means Sweet Things. Every product is handpicked and only a few make to our esteemed collection. So once a product finds its way in, jaws drop, and it literally calls your attention "I want to make your home sweet, pick me up now". Sweet Us, not only stands for quality and customer service, but also serves the artisans who make these handicrafts. We proudly boast of our excellent collection and our customer care is unprecedented and unheard. Buy sweet things and spread sweetness. You can initiate a return for new and unopened items within 30 days of delivery for a refund. To qualify for a refund, items must be in new and unused condition with all original materials and/or accessories. If a return is not received at our processing facility within 45 days, it may be subject to a partial refund. You will be responsible for return shipping costs. However, if the return is a result of a fulfillment error, product defect, or damage incurred during shipping, we will refund the full cost of the merchandise. We will provide a pre-paid return shipping label for Non-Buyer's Remorse returns. All returns are subject to inspection, and if found not to be an error on our part, the return shipping costs will be withheld from your refund. SPECIAL RETURNS INSTRUCTIONS: Once the seller approves the returns request, they will provide a Returns Merchandise Authorization. The Seller will issue a partial refund up to 20% for used or non-restockable items. 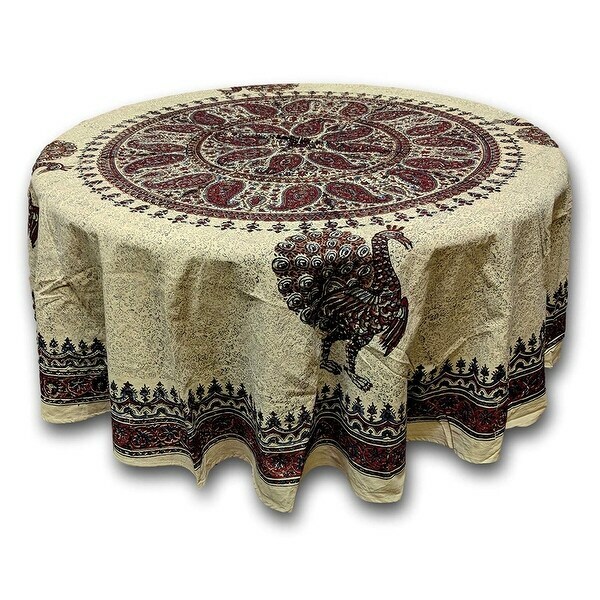 A beautiful square tablecloth highlighting a spectacular Peacock Paradise Paisley Floral print flaunted by a fascinating border. This tablecloth is a perfect fit and a necessary essential to compliment the decor of your dining ensemble. It is made of 100% cotton power-loom fabric which gives strong, tighter & smooth weave for better durability. Please contact us, we will try to find a resolution. print flaunted by a fascinating border. This tablecloth is a perfect fit and a necessary essential to compliment the decor of your dining ensemble.